Codex Imperialis: Latest projects hobby update - thousand sons, knight and eldar. 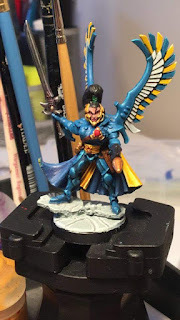 Latest projects hobby update - thousand sons, knight and eldar. I've been in a bit of a hobby lull for the past 2 months without much progress on things. I was supposed to be participating in a tale of gamers project with others at the gaming club but unfortunately failed my first months pledge of thousand sons terminators, but instead completed a custom heldrake. 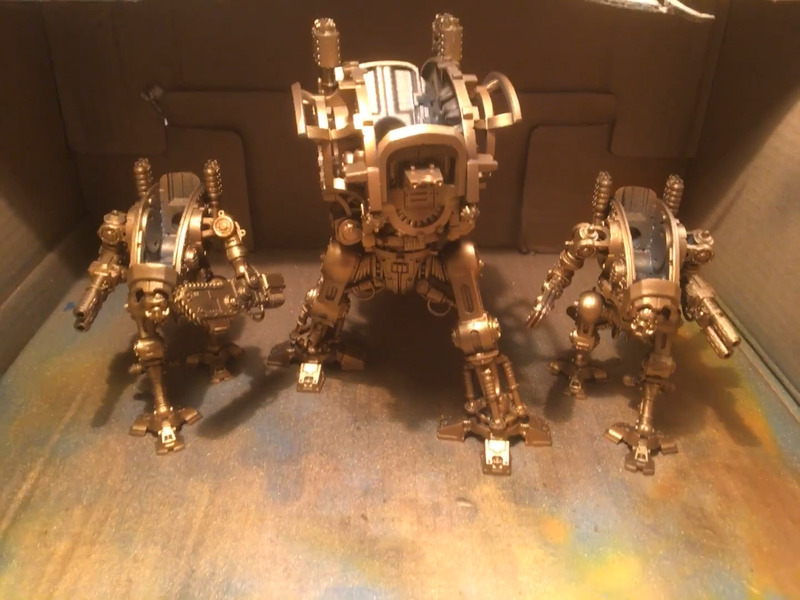 I was supposed to then complete the terminators for the second month but have barely done a thing to them due to working on our club scenery and also making a start on my knights. A bit of work on dark angels and eldar to prepare them for games has also drawn me away. I guess it's not as if I've ultimately done no hobbying, just focussed more on gaming and other projects not on the schedule. On the plus side I've hit a hobby milestone by finally investing in an airbrush, the results of which can be seen above with my scratchbuild Heldrake. I'm pretty pleased for my first effort and hope that once I get a decent extractor setup I can do more airbrush projects. As for conventional bursh painting, below can be seen my finished scarab occult terminator and a WIP custom autarch 'Kayleth' base on dawn of war 2. Speaking of airbrushing, I've made a start on expanding my knights collection. I previously had a freeblade knight and a couple of unassembled knights from renegade and a pair of armiger warglaives from forgebane. I've now started to basecoat these chaps using the airbrush so hopefully won't be too long til I have my custom house comprised of various outcasts and freeblades ready for action.